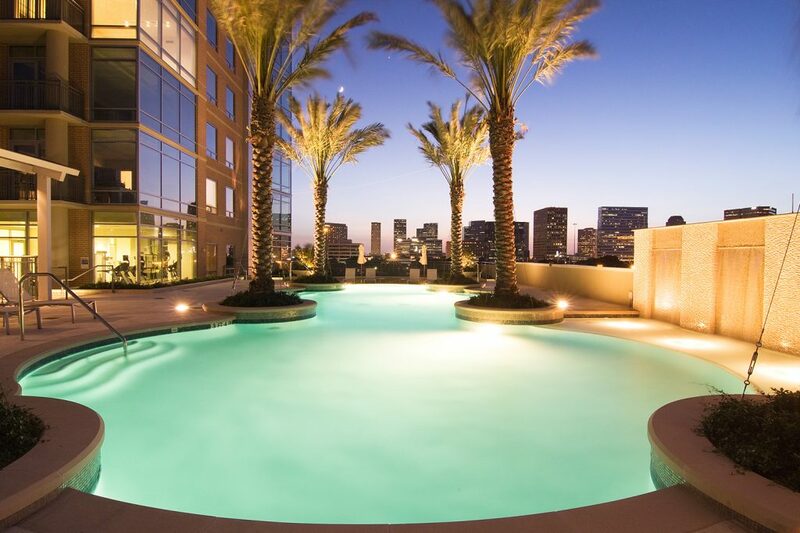 Are you considering buying a luxury condo in Houston? Get the full 41-page Luxury Houston Guide in an easy-to-read Adobe Acrobat format. Save to your desktop or read on your mobile. 1. Buy in a building with a good resale history. Houston has over 100 residential high-rise buildings. Not all of them have performed well for their owners. Some buildings are fantastic, well-managed, have great staff, solid reserve accounts and consistent demand. 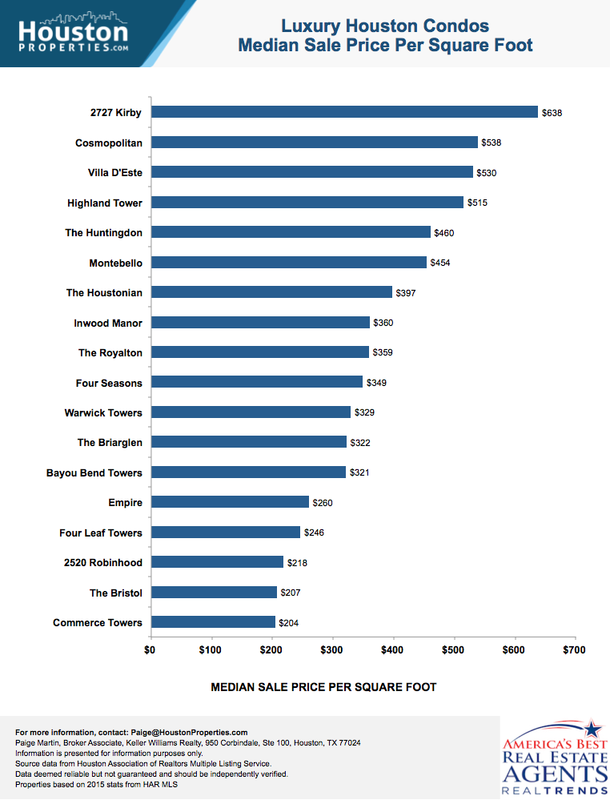 By contrast, some buildings suffer from high HOA fees (despite limited amenities), inconsistent management, and have a spotty appreciation track record. 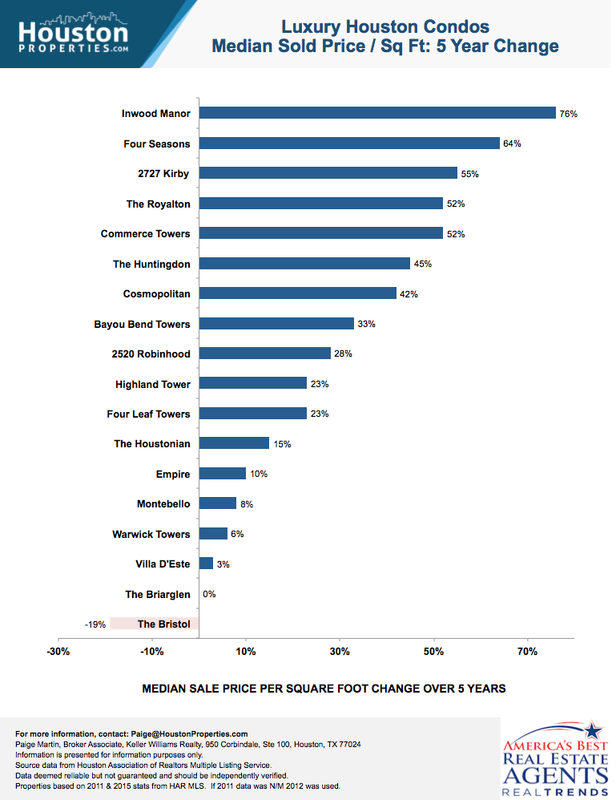 Below, you’ll see the five- and ten-year median sale price appreciation (or depreciation) rates from many of Houston’s luxury buildings. Note: New Construction Houston Condo Buildings weren’t included in this study as they don’t have 5 or 10-year track records yet. 2. Buy in line with the building’s median sale price. 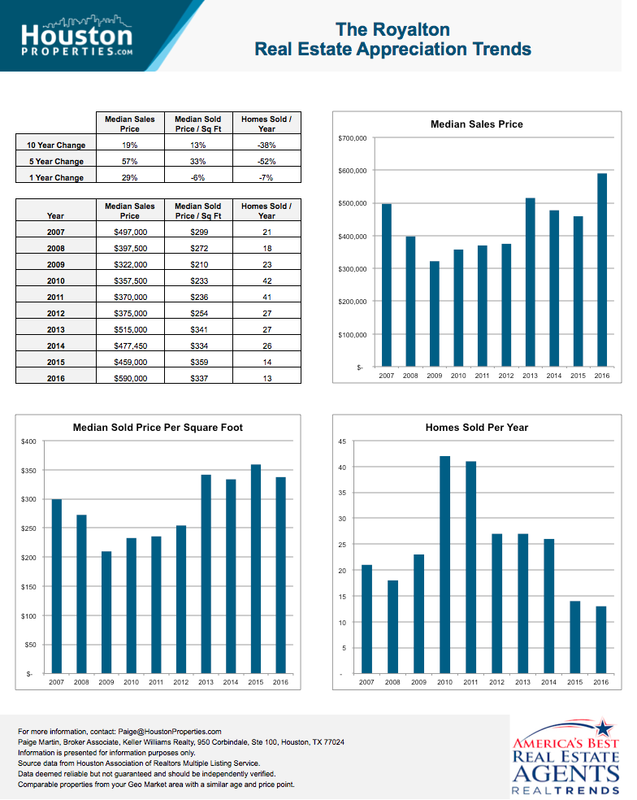 Based on sales trends from the last decade, Houston condos that were 25% above the median price for their building sat on the market more than 227% longer than their counterparts. In addition, purchasing a $1,500,000 condo in a building with a median sale price of $450,000 offers a different ambience than buying where you’re among owners who have units similar to yours. 3. Own in a building that fits your lifestyle & goals. Each of the buildings has a different personality and feel, and many of the buildings have similar cultures to other builders from their era. As you will be living “closer” to your neighbors than you would in a Gated Houston Patio Home, or Houston Single Family Home in the Most Expensive Neighborhoods, my condo clients have appreciated buying in buildings that resonate with their goals and lifestyle. A building tour is usually most helpful to experience the unique style of each property. 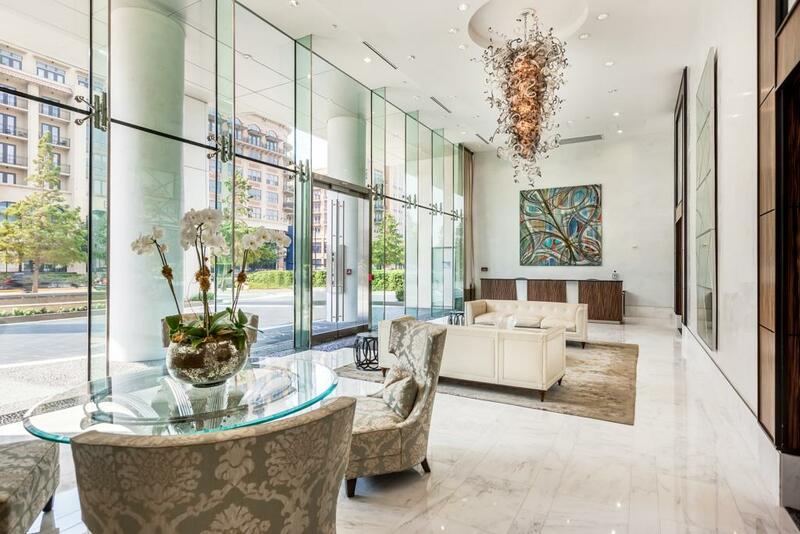 For a tour of Luxury Houston condos, building recommendations or condos for sale, contact Paige Martin, #1 Keller Williams Realtor in Houston, #10 in the United States. 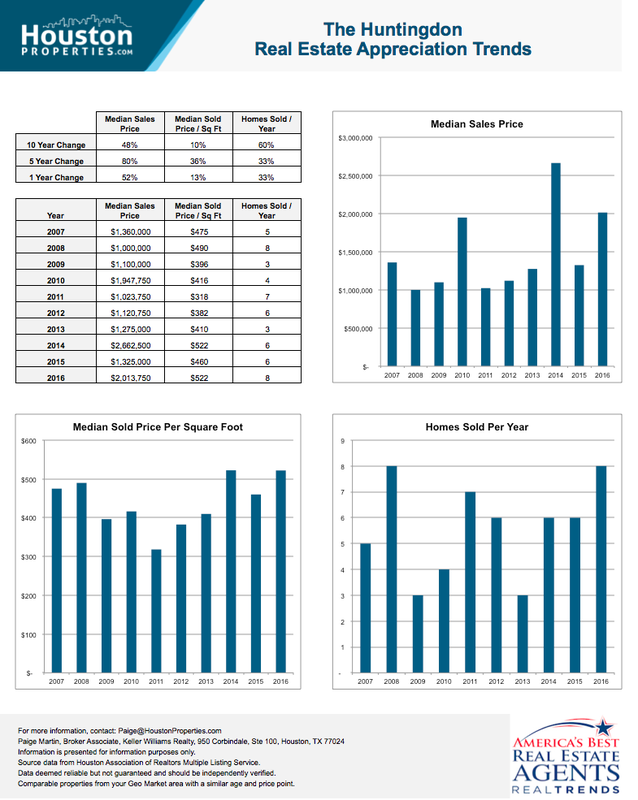 Houston luxury condos for sale data is based on the most current year’s median sale price. New buildings (without statistically significant information) were excluded. View new construction Houston condos for sale. If you’d like to see luxury Houston condos or learn more about buildings that could be a fit for you, please contact Paige Martin, ranked #1 Individual Agent with Keller Williams in Houston and #10 in the United States. 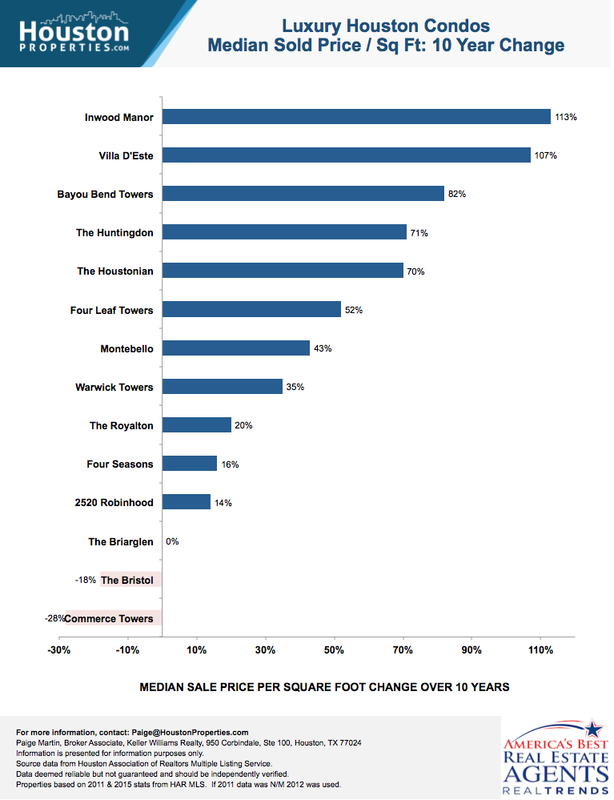 As you’ll see when you compare luxury Houston highrises by total sale price versus price per square foot, the list changes slightly. This is due to the average condo size in each building. 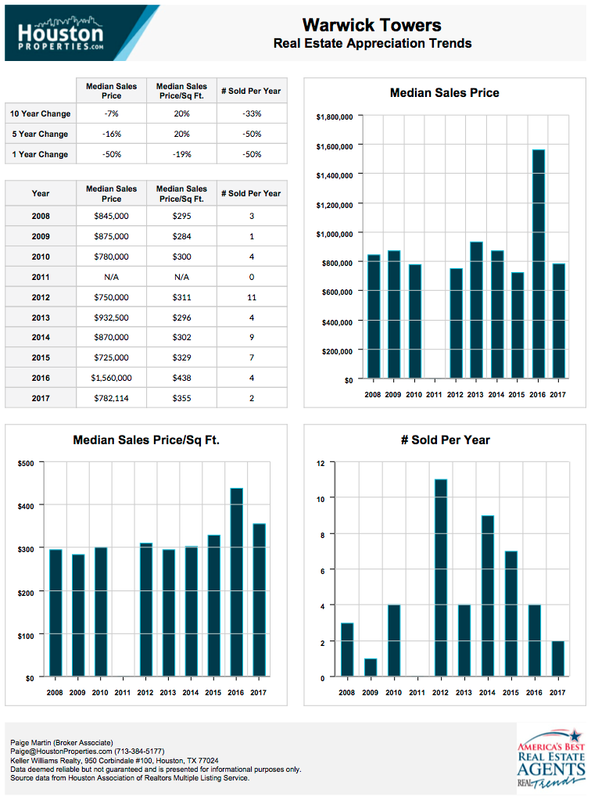 Houston luxury condo for sale data is based on the most current year’s median sale price per square foot. New buildings (without statistically significant information) were excluded. View new construction Houston condos for sale. 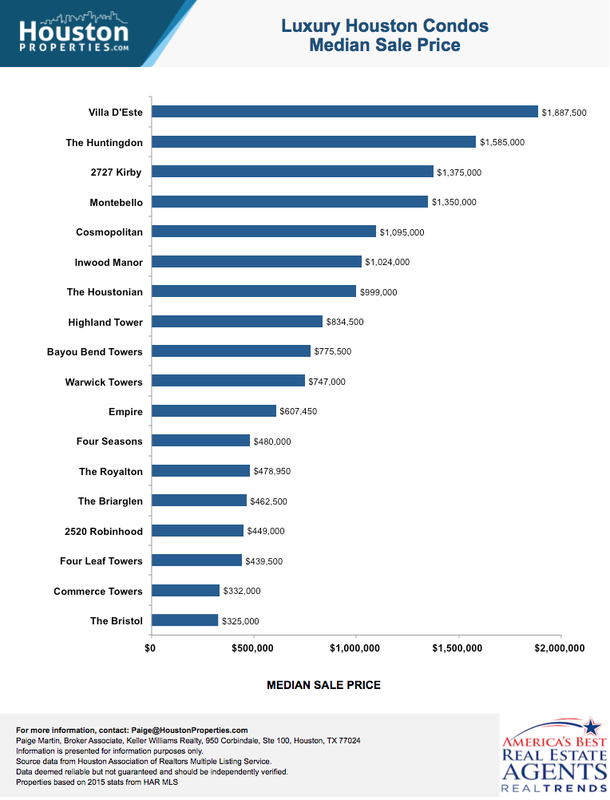 One major caveat when comparing sales trends of any luxury buildings is that the total number of sales in many of these buildings range between 0-10 units per year. This often means that one year (e.g. especially those years around financial crises) can be dramatically skewed by really expensive (e.g. penthouse units) or less expensive (e.g. smaller units on lower floors) sales. 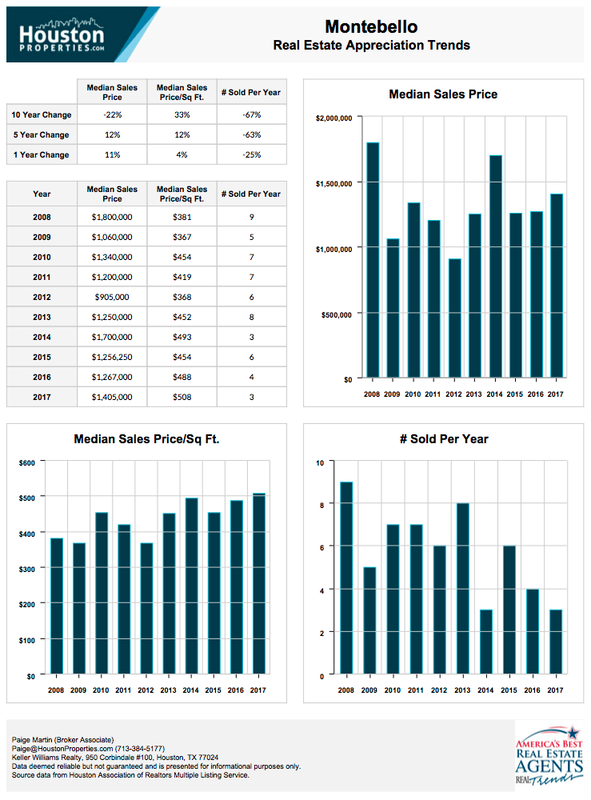 To make good buying decisions, I advise my clients to look at trends (we’ve included 10-year sales trends for many specific buildings below) and confirm that the building you like has a consistent, multi-year track record of sales in the price range where you’re buying. Similar to my comment above, it’s important to recognize that the total number of sales in many buildings range between 0-10 units per year. It’s also important to consider what was happening in the world five years ago, as we were emerging from the financial crisis. 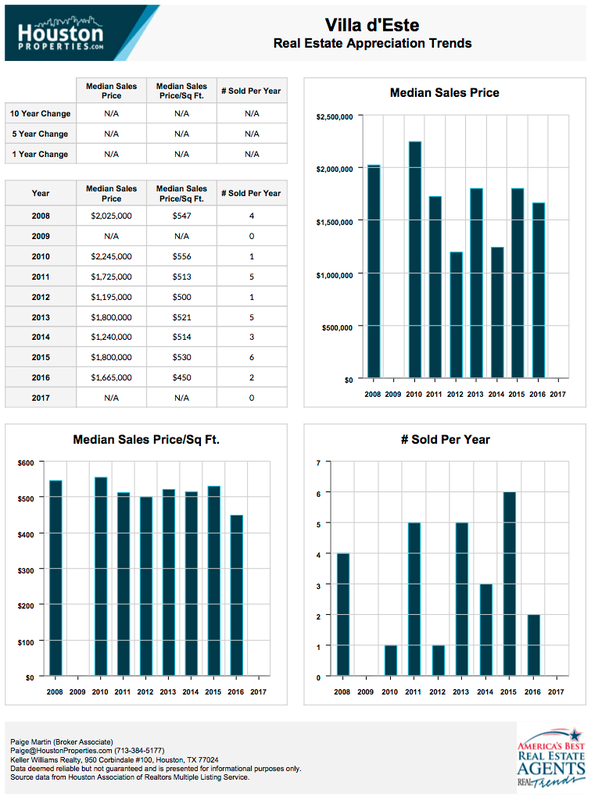 I’ve included 10-year sales trends per building below, as I believe it’s important for my buyers to understand how the building performed during the last downturn. 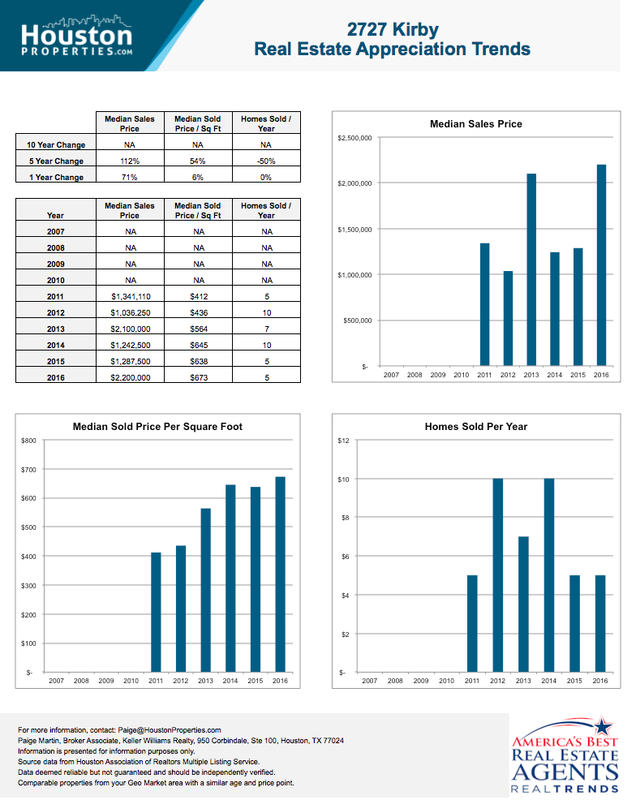 In many cases (similar to what we saw in luxury neighborhoods) is that prices dropped a little, but the volume of sales dropped a material amount. As most Houston luxury condo buyers have means, most owners “don’t have to sell during the market downturns,” and they can wait for the market to turn around. 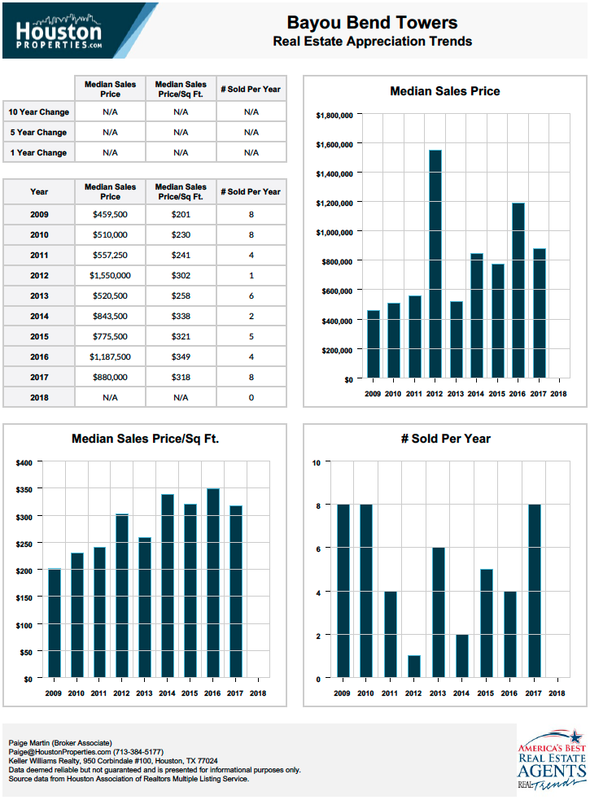 Below, we’ve included information and 10-year sales trends for a select number of luxury condo buildings. Located within Upper Kirby, 2727 Kirby sits along Kirby Drive, just south of Westheimer Road. It is nestled within one of Houston’s hippest districts and is about 4 miles away from Downtown Houston. Upper Kirby lies north of Southwest Freeway, south of River Oaks, west of Montrose/Neartown, and east of Afton Oaks. Key Houston neighborhoods like the Medical Center and the Galleria are minutes away from the Upper Kirby district. Designed by Ziegler Cooper Architects and developed by Michael Atlas, 2727 Kirby cuts the Houston skyline with a distinct contemporary design. The luxury residential condo opened in 2009, standing at 400 feet and featuring 30 stories with 96 units. Centrally located and highly accessible, 2727 Kirby is one of Houston’s most coveted addresses. High-end boutiques, posh restaurants, schools, parks, and shopping centers are within easy reach. 2727 Kirby offers a variety of luxury amenities, including private and semi-private elevators, a concierge service, five-level secure parking, a valet service, private balconies, a heated pool, a putting green and a golf simulator, two guest suites, and a private park. Bayou Bend Towers is comprised of three buildings with 108 condos for sale overlooking Memorial Park. Located between Downtown Houston & The Galleria, Bayou Bend offers many amenities and easy access to Houston’s Inner Loop. Owners of condos in Bayou Bend Towers also have the luxury of having quick and easy freeway access for both in and outside the 610 loop, I-10 and I-45. This enables a direct route to and from the most important places in the city of Houston. Each Bayou Bend Towers unit has two deeded parking spaces and one secured storage space. Penthouse unit owners get 4 deeded parking spaces. Bayou Bend Towers is about 10 minutes from the central business district, the Galeria, and the River Oaks Country Club. Also nearby are the Ima Hogg Estate, Buffalo Bayou, and Memorial Park. The Highland Tower is a 15-story residential building located at 2207 Bancroft Ln, Houston in the 77027 zip code. It is right inside the 610 Loop and just a few minutes away from the exclusive Galleria area, Memorial Park, River Oaks and Highland Village. The Highland Tower project was spearheaded by high-rise development firm, Ziegler Cooper Architects. The firm’s architectural touch can be seen by the building’s unique combination of modern and classic design tones. Brick and metallic panelings, clean lines, and contemporary finishes help compliment the Highland Tower’s imposing yet homely feel. The 99 condos for sale spread out among its 15 floors all carry the same design elements. Four-inch-wide wood floors; a choice of granite, marble, or solid countertops; designer cabinets; spacious bedrooms and living room; and European appliances help create an ideal fusion of classic and modern interior design. Located within one of Houston’s bustling retail and business centers, the Montebello is a 30-story luxury residential high rise. It is a few steps away from Uptown Park, near the beautiful wooded neighborhood Tanglewood. Standing at 30 floors, the Montebello Houston condo building features 98 units in addition to two-level penthouse units. Montebello, Italian for “pretty mountain”, was completed in 2003 and is from Houston-based Interfin, the same developer behind Villa D’Este, Four Leaf Towers, and Belfiore. Thanks to its central location, residents have near immediate access to some of Houston’s dining, retail and entertainment hotspots like the Galleria, Uptown Park, and Post Oak Plaza. Building amenities include secure underground parking, a separate service entrance, an exercise room, a heated swimming pool, and a party room. Montebello condos for sale boast of large balconies, 9’8″ living area ceilings, dual-pane windows, marble baths, and premium appliances. Each floor features four units, with sizes ranging from 2,000 to more than 4,800 square feet. One- to three-bedroom floor plans are available. 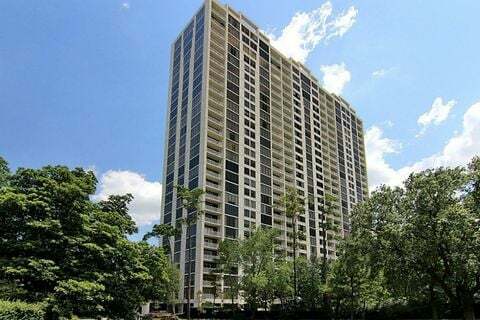 The Houstonian Estates in the Galleria/Tanglewood area is an upscale highrise residential tower with 153 condos for sale and 19 penthouse units spread out across its 28 floors. It is located at 121 North Post Oak Lane and just outside the 610 West Loop in the 77024 zip code. Standing at 28 stories high, Houstonian Estates’ residents get to enjoy a panoramic view of the entire city of Houston. It is also close to the Downtown Houston business district and the exclusive Galleria area. Driving or commuting to these places takes approximately 15 minutes. Its close proximity to Downtown and the many exciting restaurants, cafes, malls, etc. in the Galleria doesn’t keep Houstonian condo for sale owners from having a peaceful and private life. The tower is built on a secluded area over three-and-a-half acres in size. The tree-lined paths and wooded grounds help add a peaceful and relaxing vibe. All three Houstonian Estates towers carry architectural designs that create a “graceful” illusion despite the structures’ imposing height. Houstonian condos were built with space and practicality in mind as they feature open floor plans ranging between 1,050 to well over 5,100 square feet. Modern-day interior design and furnishings help compliment the residential buildings’ warm and homely feel. Building amenities include party room facilities, garden room, jacuzzi, swimming pool, sauna, tennis court, outdoor grills, and more. What really make the Houstonian Estates stand out however is the quality of its concierge, housekeeping, and valet staffs’ services. Developed by James E. Lyon, The Huntingdon luxury high-rise has been a River Oaks landmark since 1984. Currently pegged as the 27th tallest building in Houston, The Huntingdon has 34 floors and 120 luxury condos for sale. Standing at 503 feet, The Huntingdon towers over the peaceful and affluent neighborhood of River Oaks. 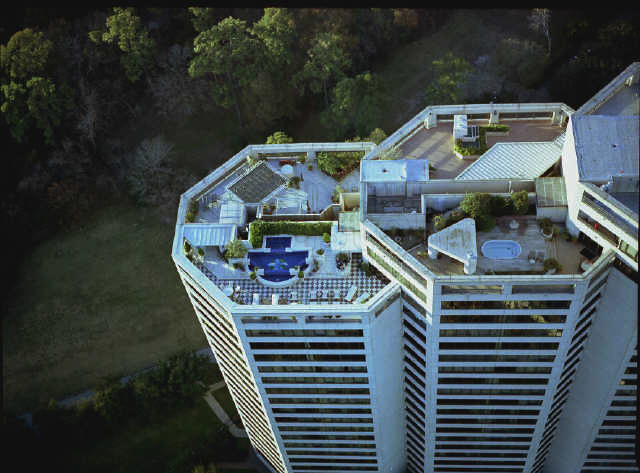 It serves as a centerpiece to one of Houston’s more prestigious and exclusive areas, providing its residents with exclusive access to amazing River Oaks views. The Huntingdon was from developer James E. Lyon and architect Talbott Wilson. It opened its doors in 1984, and has since become a prominent landmark in Houston’s most affluent neighborhood. The luxury Houston high rise is known for its well-appointed units with spacious rooms, modern interior designs, and premium appliances. Featuring 120 units spread across 34 floors, The Huntingdon offers a variety of floor plans ranging from one to three bedrooms. The most expensive units can offer as many as 4 to 5. Building amenities include such concierge and valet services, tennis courts, two swimming pools, an exercise room, and a sauna. 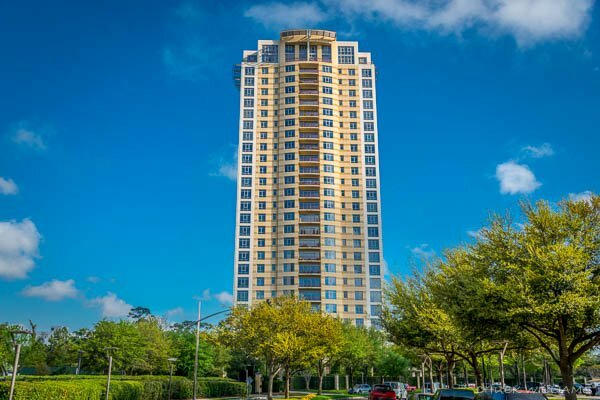 Located at 3333 Allen Parkway Houston, Texas, 77019, The Royalton at River Oaks is a towering 33-story high residential condo built on a 2.7-acre site in the River Oaks area and just one mile west of Downtown Houston. With its 33 floors, The Royalton Condominiums perches over the peaceful and affluent neighborhood of River Oaks. It serves as a fitting beacon and landmark to the exclusive and upscale River Oaks neighborhood. The Royalton’s towering structure also provides its owners exclusive access to the amazing Downtown Houston, Galleria, and River Oaks views. This architectural themes extend to The Royalton’s 253 condos for sale, with its carefully crafted interiors highlighted by gourmet kitchens, grand master bedroom suites, private balconies and lavish designer finishes. Royalton condos come in one-, two-, and three-bedroom variants designed with 27 varying floor plans. Royalton at River Oaks condo owners also enjoy the 24-hour workout facility, hair salon, cigar bar, private wine room, large conference and dining rooms, banquet/ballrooms with a service kitchen, garden cocktail terrace, pristine pool with sundeck, recreational game room with a huge screen TV/private theater and bar. Located at 1111 Hermann, Houston, Texas 77004, Warwick Towers is a pair of residential condo highrises interconnected by five bridges. These uniquely designed 30-story high twin towers form one of the more recognizable landmarks in Museum District. Warwick Towers Houston is also near Texas Medical Center and Hermann Park, and is directly accessible from the Houston Museum of Natural Science, Houston Zoo, and the Miller Outdoor Theatre. 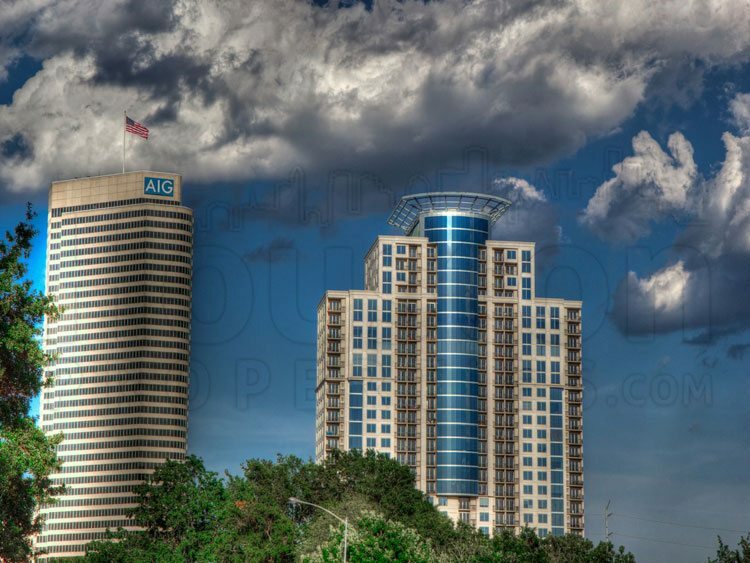 Warwick Towers perches over Houston’s historical and cultural center, Museum District. As the name implies, the Museum District is surrounded by a variety of museums and other cultural and entertainment community venues. 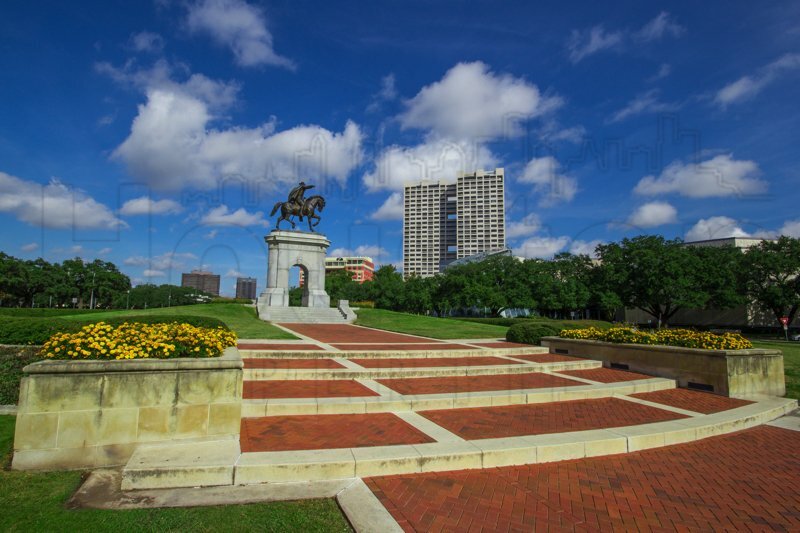 A short, but scenic drive through Houston’s Hermann Park will take you to the heart of the Houston Museum District and its 19 well-known museums. Residents of condos for sale in Warwick Towers have the luxury of being minutes away from these cultural destinations, along with the many commercial establishments within the area. Rising 30 floors into the Houston sky, Warwick Towers features 126 condos for sale. The “twin towers” that make up Warwick Towers are connected by five bridges, and there is a rooftop terrace on the top of the fifth floor parking garage with several decorative concrete patterns, shrubs and trees, a three-tiered fountain, putting green, copper-roofed gazebos, tennis court, a jogging trail and areas for barbecuing. Other Warwick Towers amenities include 24/7 concierge, valet, porter, dry cleaning pickup, exercise room, sauna, formal Board Room and informal Terrace Room with kitchens. 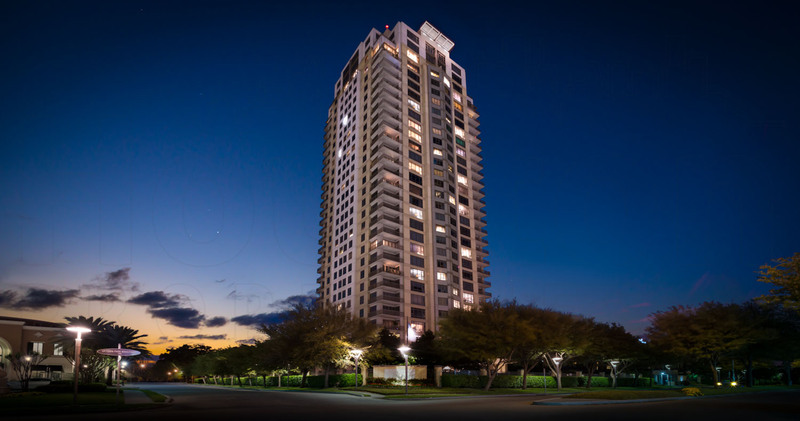 Located at 1000 Uptown Park Blvd in Houston, Texas 77056, the Villa d’Este residential highrise graces the Uptown Park skyline with its 27 floors of modern architectural structure. 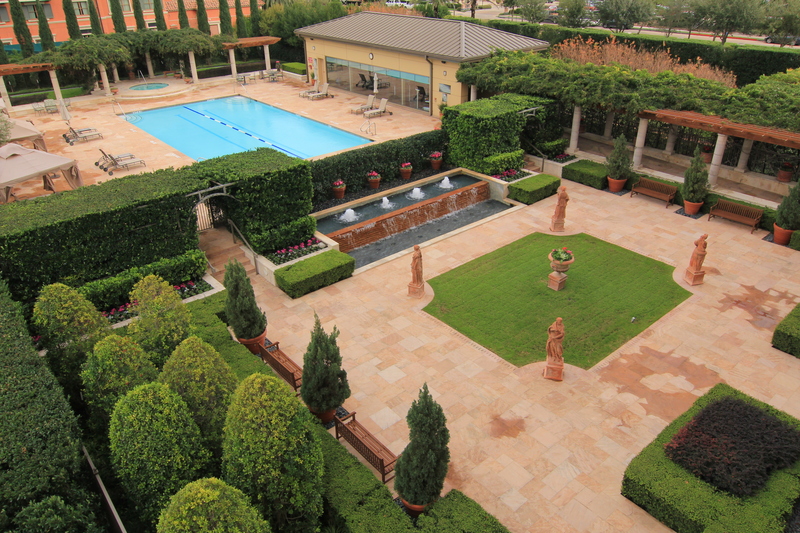 Built in 1999 by Ziegler Cooper Architects, Villa d’Este Houston has 100 condos that come in one-, two-, and three-bedroom floor plans ranging between 2,390 to 4,305 square feet in size. The 27-story high Villa d’Este Condominiums towers over the Galleria skyline, along with residential highrises Four Leaf Towers, Montebello, and Cosmopolitan. These luxury residential skyscrapers are surrounded by numerous commercial establishments (restaurants, bars, cafes, clubs, and more) in the Post Oak and Broad Oaks area. Villa d’Este is an imposing residential highrise specially with its modern architecture and aesthetically pleasing column- and glass-heavy design tones. 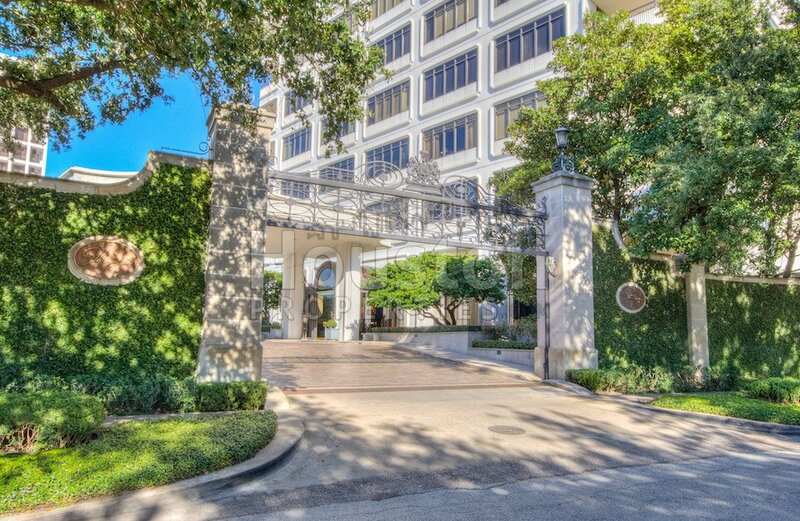 The classic Texas limestone exterior is complemented by landscaped grounds, underground parking, a beautiful swimming pool area, a health club and two tennis courts. The interiors of condos in Villa d’Este have very tall 10-ft. ceilings, marble baths, granite-topped kitchen counters and classic wood floors in the entry foyers. The Villa d’Este condos for sale come in one-, two- and three-bedroom variants. School information is deemed accurate as of the time of this writing, but is not guaranteed. Please independently verify and confirm enrollment. Please contact the school district to determine the schools to which any specific property is zoned. The list of the Best Schools in Houston above only includes public schools with defined school boundary maps that have both a 3 of 4 Performance Index Ranking and a 7, 8, 9 or 10 rating (of 10 possible) from GreatSchools.org. 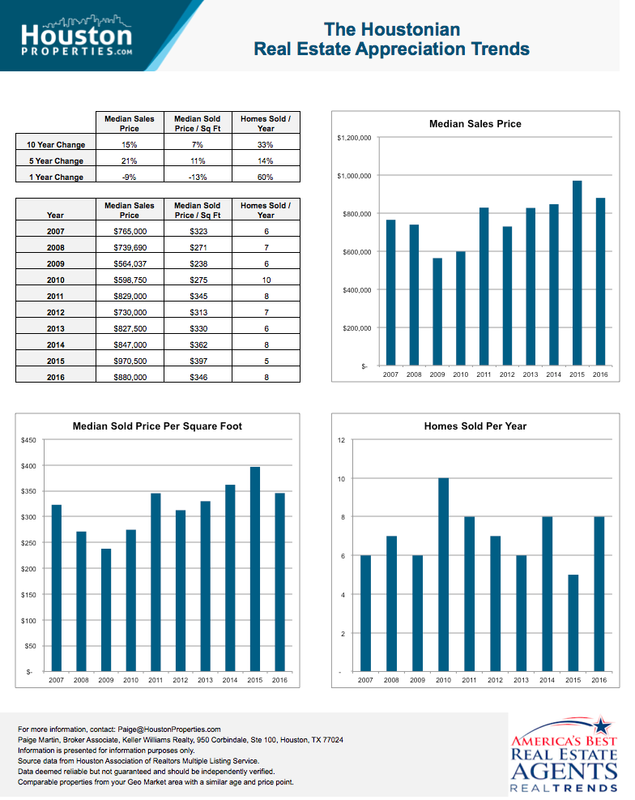 Median home values are calculated from last year’s single family home values, according to data from HAR MLS, from the school’s boundary. 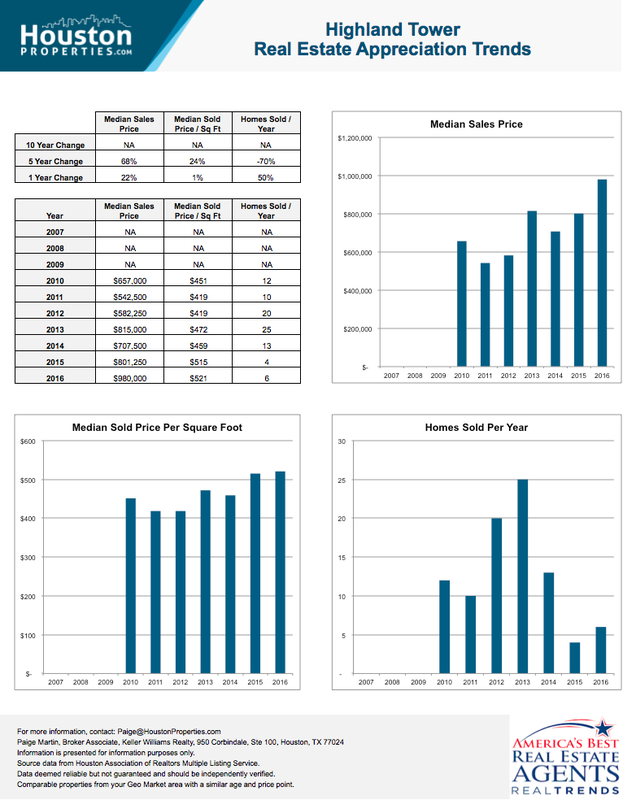 10-year real estate appreciation trends are calculated from comparing median single family home sale values from 10 years ago as compared to data from the most recent year.